Discover the best brake kits by Power Stop. When you’re searching for the best brakes on the market, user reviews are a driver’s best friend. 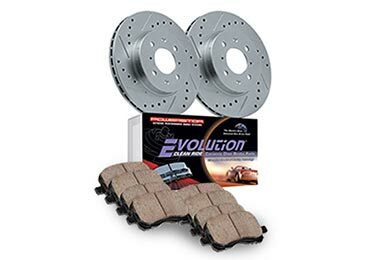 Read a Power Stop rotors review or a Power Stop Evolution brake kit review, and you’ll get the skinny on the power of Power Stop’s braking prowess. You can compare notes on cross drilled and slotted rotors, brake pads and lines to ensure you've maximized your braking potential. From brake rotors to brake pads, a Power Stop Truck & Tow Brake Kit gives drivers the stopping power they need when they need it most. 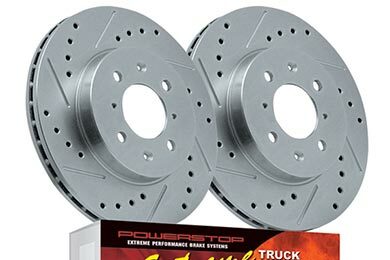 Power Stop offers a selection of cross drilled slotted rotors like the rotors made famous by sports cars around the world. Couple stainless steel brake lines with a Power Stop brake kit, and you’ve harnessed the power to stop when you need it most. Ready to get your stop on? Since each component is precision machined and crafted for an exact OEM fit, installation is a breeze. In no time, you’re ready for some serious action backed by Power Stop’s 3-year/36,000 mile limited warranty of your high-performance brake kit. Function or fashion? Performance or style? Power Stop brake kits produce up to 20% more stopping power, enhanced control and a hot look behind your wheels. Get big brake performance from a bolt-on kit and optimize not only your stopping power, but also the power to turn some heads. You’re ready to rock and roll knowing that you have the power—not the power voodoo. You do have the power when it comes to Power Stop. We also have loads of brakes & brake pads reviews, big brake kit reviews, and brake pads reviews on our site, be sure to check them out. I needed to replace the pads on my TL and figured for an extra few bucks I would enhance the looks at the same time with new rotors. I certainly did my research and found for the price and warranty, these would work really well for everyday driving. I get a bit crazy at times, but nothing too extreme. The rotors and pads installed as easily as could be expected. The only tedious part was painting the calipers and brackets while I was at it. I was disappointed to find the rotors were actually cast in China (spec sheet said made in USA), but all machining and drilling is done in America. 1,000 miles and a bit more brake dust than expected, but this is decreasing as the break-in period ends. They feel and look solid. So far so good! Excellent kit. Brake and rotors work very well. Price was excellent and seems to be a very good product. Re. the 1st question below ques. was where made, but ans. did not respond to specific question. Please advise where made. Thank you. We manufacture a limited range of brake rotor applications in our Bedford Park, IL facility. A larger percent of Power Stop performance brake rotors are manufactured to our specifications, blueprints and processes developed over years of experience by our manufacturing partners overseas. Reference # 756-911-812 © 2000-2019 AutoAnything, Inc.